Searching for a professional kit that makes your loved ones' riding/biking experience safer and more thrilling? Our premium safety gear set will be a perfect solution for you. 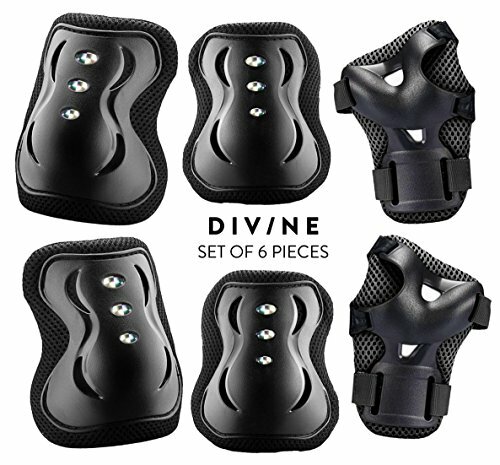 DIV/NE protective pads set is made of durable soft material that is comfortable for children to wear. With such a cool set providing perfect protection to elbows, knees and wrists, your children could safely enjoy rollerblading, riding, cycling and other outdoor sports. Compared with the same pieces on the market, our safety gear is more comfortable and shock-absorbing. We pride ourselves on our premium quality products and exceptional customer service. Be sure not to miss such a fantastic safety gear of premium quality and favorable price. Whether you are looking for equipment to reduce injuries from falls or tools to help your loved ones' riding look cool and professional,this quality-assured protective set is just for you. [Full Protection] With three body-part pads included, this protective set allows children to enjoy the riding experiences with perfect safety protection to knee, elbow and wrist. The specially-engineered safety pads efficiently absorb shock and reduce the danger of sufferings joint strain. [Professional Quality] It aids greatly to reduce the potential injuries caused by falls. Made of durable materials and breathable fabrics, this protective gear is wear-resistant and wet-absorbing. [Designed for Children] Similar to adults, children also explore their riding experiences excitingly and aggressively. This set of anti-shock protective gear is specially designed for those children who are excited about outdoor sports. [Comfortable Wearing] Breathable air between the pads and body makes children feel comfortable and relaxed when riding or skating. The elastic adjustable straps could flexibly suit for small sizes of knee, elbow and wrist. [Fashionable Look] Designed for a more fashionable outfit to riders, this pads set will make children look cool, casual and stylish in their riding adventure. If you have any questions about this product by Divine, contact us by completing and submitting the form below. If you are looking for a specif part number, please include it with your message.